You know there is more to this life. You know there is magic to be unlocked in your cells. Wisdom to be downloaded from you womb. Ecstatic bliss to reawaken from a long dormant sleep. You remember the power of the elements and feel the current of creation coursing through you like a wave. Every day your remember more and have a deeper sense of who and what you are beyond your identity and your vessel. But you yearn for the container to explore. And for the permission to live your magic in this life. To dance, sing and express your true self. To listen in to the messages of Spirit that speak through you body. To release the tension and trauma from lifetimes that holds your constricted and stuck. And you yearn for a sisterhood to hold you as you reclaim your sovereignty. A circle of priestesses who, like you, have been walking this path of the feminine for lifetimes. It's time to come home to yourself. and awaken your wild Shakti in Ibiza. This is a powerful week of feminine embodiment, yoga and somatic movement, dance, sound, archetypal and goddess exploration, ritual and ceremony providing deep healing, light body and multidimensional activation. This is a gift of the highest self love to plug you back in and bring your magic online! Join myself & my team of special guests for a 7 day journey to transform your life and connect with your essence as a wild and powerful radiant goddess! Thank you for your enquiry about my next Bali retreat! Look out in your inbox for more information very soon! Working deeply with the energy of Gaia and learning how to properly reconnect to the Earth and grid of our planet and beyond. & plenty of time for integrate and relaxation in the sunshine... drinking in the magical energy of this special island. AND REMEMBER WHO YOU ARE! We arrive and settle into our deluxe private villa and attune to the land. Our sacred container is anchored in an opening Priestess Circle, dropping us into the depths of our wombs and plugging us into the heart/womb grid of the planet. We call in our energetic allies, the elements, our Goddesses, Great Spirit and speak our clear intentions to the field. Each sister is personally honoured and blessed for showing up for this soul adventure. We arrive in our bodies with nourishing movement practices. Grounding and listening. 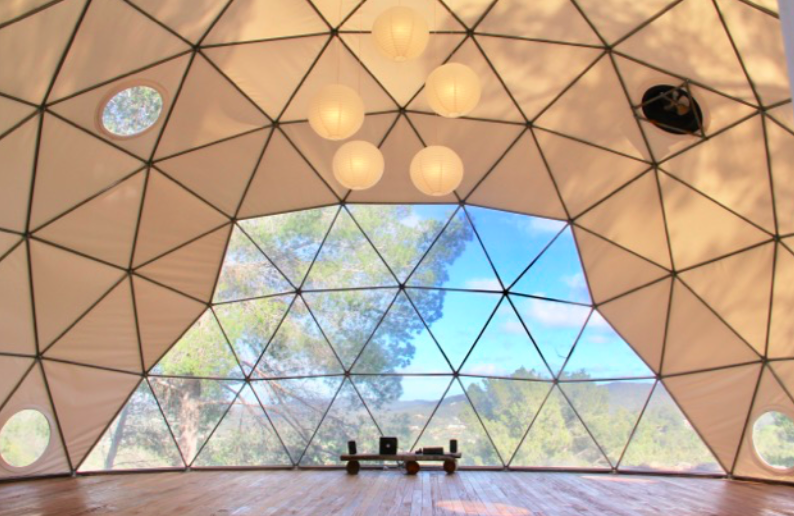 Finding safety and support and we plugging deeply into the energy of Mother Gaia and the isle of Ibiza. We tend to the temple of our yoni and womb, reconnecting to the wisdom of this forgotten portal to the Divine. We begin our journey of remembrance of the feminine mysteries with Mary Magdalene and Isis as our guides, exploring our original innocence, our sensuality and reclaiming our infinite potential to birth all we wish through our sacred womb. We listen and feel for the blocks and the wounding that could be holding us back, summoning Divine Mother and holding ourselves and each other so gently as we return ourselves to our natural state of radiance. Shamanic womb clearing journey uniting you with the Goddess of your womb temple and meet the seven grail gates of the womb. We explore conscious menstruation and the blood mysteries and birth your own moon time rituals and opening to your inner wise woman. We walk through the fire and remember our power as creator beings. Goddess Kali, Durga and Sekhmet hold our hands as we pick up our sword of discernment and churn and burn away that which hides in the most shadowy recesses of our being. We embody our wild woman and set ourselves free. We know we must purge and surrender the old to make space for our divinity to shine through. This is the cleaning of the diamond to reveal our gifts. Practices to purify and igniteour sexual energy for creativity and manifestation. Elemental dance journey embodying the many faces of the feminine. Goddess Kali is our key code guide, walking you through the fire to unleash your wild woman. Today we soften into our heart cave and explore the resonance of our inner knowing. We forgive and relax into the arms of the Mother. We align with Divine Love and feel Sacred Union within. We release our fears and sing our soul song, telling our story and sharing our our alchemical frequency with the world. We open as the channels for our creativity to flow, as movement, as words as primal sound. Awaken your voice and reclaim your soul song. Candle lit yoni steam and womb blessing ritual. Today we rise as the Priestesses we are, walking with Mary Magdalene and Inanna. Ready to dive deep into the underworld when required. Awake to our Shakti magic. Ready to serve in the world. Today is a day of deep honouring as we come to see ourselves and each other as we truly are. We integrate and close our sacred circle, feeling the harmony within. We are renewed, aligned and ready to beam our radiant lights into the world, lighthouse Queens we are. All prices below are per person in Euros. Single rooms are available for an additional 200 Euros pp. Early bird prices are available until June 1, 2019. To claim your space, all I need right now is your 400 Euro non-refundable deposit and the rest can be paid via payment plan closer to the date. The Chettinad is a peaceful haven in the hills overlooking the rural Sant Agusti valley on the island of Ibiza. The air feels pure and clean, and the view of distant peaks piercing through the morning mist is a perfect way to start off your day of healing, pampering or yoga practice. The hillside property is a restored finca that is a perfect marriage of old Ibiza meets bohemian chic, lovingly restored in a delightful blend of classical architecture, modern interior design and 21st century conveniences. A terraced swimming pool, framed by extra-large group seating and dining, is the focal point of the main house's exterior. But natural rock landscaping, beds of fresh herbs including mint and rosemary, trees bearing almonds, figs, pomegranates and oranges, and hammocks dotting the property all vie for attention and pride of place, giving guests many options to choose from when in search of a chill zone or a secluded place to reconnect with nature or one’s self. And my favourite part is the dome temples space for our sacred women's work. The menu is vegetarian based on fresh locally grown ingredients, lovingly prepared by our holistic, whole-food chef. The menu will be refined sugar and gluten free and special dietary requests can be catered for. This island is a magical energetic hot spot which has attracted many for centuries. You may know Ibiza for its wild party side (and yes you can do this here too) but I love this place as it is a vortex of creative and highly magnetic energy, super charged by sacred Es Vedra to the West of the island. Ibiza also has incredible beaches, pine forests and rustic villages that help you step back in time... but it is really the healing energy that calls me. As many of you know I met my husband on this very isle and there is something about its energy that summons me... and when this happens I have to obey. Airport transfers may be arranged upon request or you may choose to hire a car to enable you to explore the island during your stay. You can also fly directly into the airport in Ibiza and you will find many budget airlines to take your from the UK and Europe. We are able to provide you with further info about airlines flying to Ibiza, and can arrange airport shuttle. Be sure to ask.